Sometimes, tattoos can remind us of previous memories or an identity that we no longer associate with. In fact, the most common tattoo that people want to remove is the name of an ex. As the safest and most effective way to remove skin tattoos, we use dermatological lasers so that you can feel most satisfied with a clean slate. 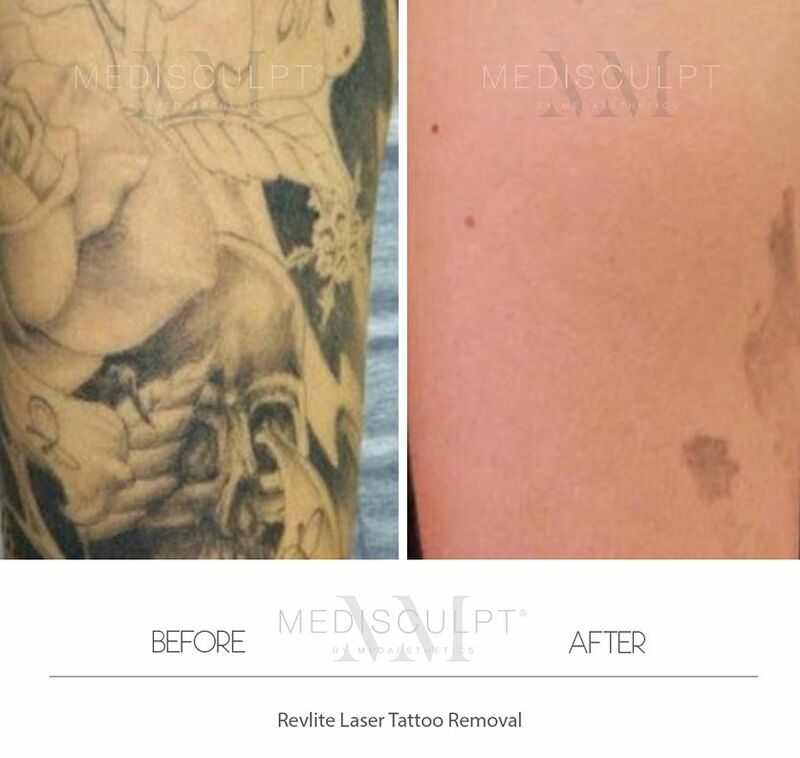 For the past eight years, Revlite™ Laser by ConBio™ has set the benchmark for medical laser tattoo removal. Important Note: Non-laser methods (such as injecting acid into the skin) to remove tattoos are extremely dangerous and can result in severe infection and scarring. In Western Australia, only qualified medical doctors are allowed to operate Class-4 (C4) medical Lasers by law. 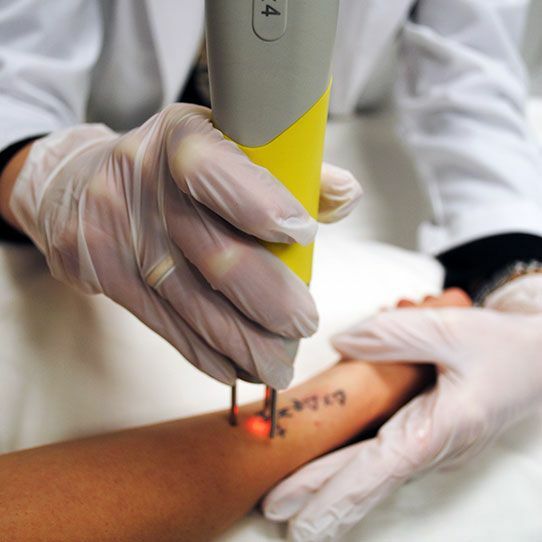 It is imperative for anyone wanting to have a tattoo removed to check the professional qualification of their service provider and the brand of the laser used. There is no government body regulating non-medical laser technicians in Australia. Lasers have been used for tattoo removal for more than 20 years and remain as the gold standard in tattoo removal today. Over the past few years, several non-laser based tattoo removal techniques have emerged with extraordinary claims. However, the ability to remove professional tattoos using this method is questionable and often dangerous to the skin. During Laser Tattoo Removal, the laser emits a pulse of light that is absorbed into specific colours of ink. The laser light penetrates the skin at high speed (billionths of a second) and produces a shockwave effect that disperses the ink particles into smaller pieces. The body then identifies these particles to be attacked and removed by the body's immune system. Can any colour of tattoo ink be removed? Unlike most other laser devices in the today's market, the Revlite™ Laser is able to emit 4 wavelengths of laser beams to target the widest possible range of ink colours. In our experience, not all colours respond very well to laser treatment. Blacks and reds are removed effectively as well as some brown, purple, orange, pink and occasionally yellow shades of ink. Greens and blues are less effectively removed; however, these can be faded by up to 50% allowing a more successful cover-up after. It has been found that 80% to 90% of tattoo images are comprised of black ink. Generally, different ink colour pigments settle in different depths of the skin. Black ink settles the deepest in the skin, while blues/greens settle mid-skin and reds/oranges settle at the surface of the skin. In order to successfully treat different ink colours, different wavelengths are required to properly target each colour and its depth within the skin. When taking into account where the ink colours reside within the skin, research has proven the best wavelength to successfully target dark pigments (black, dark blues etc.) is the Nd:YAG 1064. The best wavelength to target difficult blue and green colours is the 694 and the only wavelength to target red is the 532. How many treatment sessions do I need? During your consultation, your doctor will evaluate the amount of tattoo removal sessions needed to remove your tattoo(s). On average, most black ink tattoos require between 10 to 15 sessions spread over several months. How is the Revlite™ Laser different to the Picosure™ Laser? Both Revlite SI™ and Picosure™ lasers are manufactured by the same American company, Cynosure™ (which recently purchased Hoya Conbio). Revlite is a Q-Switched Laser operating in a nanosecond range, delivering 1064 nm and 532 nm wavelengths. The MultiLite Dye Handpieces extend the wavelength capabilities to include 585 nm and 650 nm. Hence, there are four wavelengths available to readily target the most diverse range of tattoo inks. The inability to remove red coloured inks. How frequently can I return for follow-up treatment sessions? Tattoo fading is a slow process that also depends on your body’s immune system to work effectively. We recommend that you wait at least 4 to 5 weeks to achieve the greatest value from each laser treatment. The discomfort of laser tattoo removal is often described as 'a rubber band snapping the skin'. However, the pain experienced varies from client to client. At Medisculpt, we do our utmost to minimise any pain or discomfort. We also employ the use of a high-strength topical numbing cream and skin cooling with a cryo-chiller device; when paired together, these work to be highly effective. If the tattoo looks healed, can I come in to remove it before the six-week mark? It takes four weeks for the body to start breaking down the ink and even though the tattoo may appear healed, it is likely not to be. During Laser Tattoo Removal, the laser breaks the ink down into smaller pieces for the body to remove. This process takes 4 to 6 weeks, so getting treated sooner than this period will not remove the tattoo any quicker. As well as that, it can also put you at risk for scarring. Are there any post-treatment limitations? We advise patients to limit the amount of physical activity they perform and to avoid direct sun exposure for the first 24 hours. If the patient's body gets too overheated, this can cause the tattoo area to blister. Showers may only be taken with the use of lukewarm water and mild soap. Am I able to have just a portion of the tattoo removed? Yes, the laser used in this treatment is accurate and can remove any unwanted parts of a tattoo. I have permanent make-up (such as tattooed lip liner, eyeliner ad eyebrows). Am I able to remove it using this treatment? Yes. This is the most commonly performed laser tattoo removal treatment at Medaesthetics. However, there is a small risk associated with these mentioned areas. Some cosmetic inks have metallic bases, and when the laser beam comes into contact with it, the composition can turn black. Once this darkening occurs, it can take several sessions to fix it. A test spot is always performed on first. The price of the treatments depends on the size of the tattoo you are seeking to have removed. We will have to assess the tattoo to discern the exact size of it, as we do not charge for any areas with open space. In fact, most people tend to overestimate the size of their tattoo. For reference, a coin-sized tattoo costs $150 per session. Am I able to lighten the tattoo to have another one tattooed on top? Of course. Depending on the colours of the tattoo, we recommend having 3 to 5 treatment sessions done to lighten it before getting a cover-up tattoo. You should wait six weeks between your last treatment and when you decide to get your new tattoo. I got my tattoo one week ago. Can I have it removed right now? Unfortunately, the answer is no. You must wait six weeks after you get your tattoo to start the removal process. The aftercare of laser tattoo removal is very similar to the aftercare you had to follow after having gotten your tattoo in the first place! During laser treatment, your tattoo may turn white briefly. It can then swell and turn red, but this will usually only last a few hours. It is essential to keep the tattoo area covered with ointment and a bandage for the first day. Typically, this will feel like a mild sunburn and will not hurt unless it is rubbed against. Between your treatments, it is crucial to keep the tattoo covered from the sun to prevent hyperpigmentation (darkening). You will receive a complete set of detailed instructions during your appointment. Dr Jadoon behind the scenes with a typical "tattoo eyeliner" case. Watch to see the full procedure and explanation by Dr. Jadoon.